Idea Cellular Launches 4G Across 75 Towns in 5 States! Idea Cellular, India’s 3rd largest telecom company, has shocked everyone with their 4G launch across 750 towns in 5 southern states: Andhra Pradesh & Telengana, Karnataka, Kerala and Tamil Nadu. 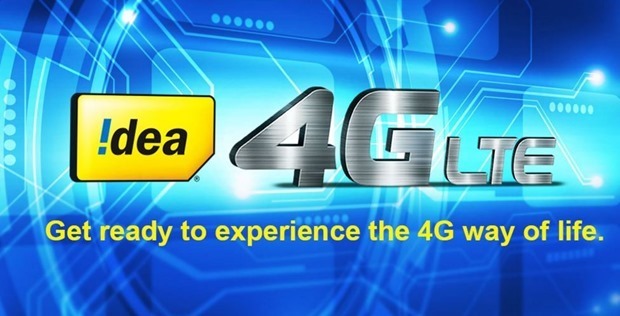 With this, Idea has become the 3rd telecom company to offer their 4G services. Airtel launched their 4G services in the month of August, 2015 and Vodafone recently launched 4G in Kochi, earlier this month. Interestingly, Idea has fairly beaten Reliance Jio’s 4G launch, which has been declared to be happening on December 27th. Considering the hype and the momentum built by Reliance Jio regarding their 4G launch, Idea has certainly scored a point here. Reliance Jio had earlier launched 4G services only for their employees, backed with subsidized 4G LTE handset. By mid-2016, Idea plans to expand their 4G footprint across Madhya Pradesh & Chhattisgarh, Maharashtra & Goa, Punjab, Haryana, North East and Orissa; with a target of covering 750 towns across 10 telecom circles by the end of 2016. As of now, Idea commands 1800 Mhz spectrum across 10 telecom circles of India, which is almost 50% of the overall telecom market. Data usage from this spectrum accounts for 60% of their revenues. 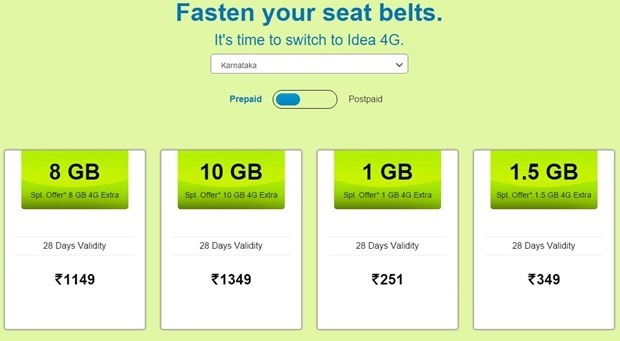 To make the launch interesting, and appealing to the pre-paid users, Idea have launched a special trial pack of Rs 29, which would be available across these 750 towns. This trial pack will contain 4G SIM upgrade, along with free movies, music and gaming content for users. Besides, on their website, Idea is promoting various 4G enabled handsets such as Samsung Galaxy S6, Micromax Lumia 950 XL and Intex Aqua Trend. Available at special discounted rate, these handsets can be ordered online directly from Idea’s official website. The initial 4G plans have been designed to lure first time users and to encourage more data usage. For example, in Karnataka, pre-paid users can start their 4G experience by choosing a minimum of 1.5 GB plan for Rs 349, which includes ‘special offer’ of 1.5 GB extra bundle. For post-paid customers, the minimum plan is 2GB for Rs 450. Idea is assuring a minimum speed of 6 Mbit/second for their 4G services. You can get more information about Idea’s 4G services here. "Idea Cellular Launches 4G Across 75 Towns in Andhra, Telengana, Karnataka, Kerala & Tamil Nadu", 5 out of 5 based on 2 ratings. Mahindra Group Launches MoboMoney, a NFC Based Digital Wallet! Reliance Jio’s Rs. 999/- Android-Based 4G VoLTE Feature Phone Coming Soon! Reliance Jio To Launch 4G VoLTE Feature Phones In India Soon! Exclusive: RCom 4G LTE Launched In Delhi. Offers Excellent Network Quality! Google Playstore Activates Carrier Billing For Idea Cellular Subscribers!